You know those beautiful moments – the way the grasses blow in the wind, the shadows the washing on the line creates, the glimpse of a red coat on a grey day - things that you only notice when you’re relaxed and happy? Well that’s what this exhibition is all about. Those little, quiet, ordinary, beautiful moments that bring a smile. The artists we’ve chosen are skilled at observing these and have captured them in different ways for this show. Stef’s practice develops from an ongoing relationship with the landscape. Walks, set aside, field edges and weather patterns are explored and documented working directly with plants. The ink, plant and paper hav- ing equal say in the process. Slow growth, chance and subtle nuances of difference all play their part. This way of working immerses Stef in the landscape. The picking of plants and laying them out on an inked up plate, rolling squashing and smelling has a slow rhythm that feeds into a connective thread from the space of the external landscape to the inside space of the studio. All Stef's work for this show has been developed from walks in the nearby Hackfall wood and along the river Ure. Much of Janis Goodman’s work is focused on structure either of inner city Leeds, where she lives or of the repetitive patterns of nature. She is as fascinated patterns formed by roofs, walls and chimney pots as by plants, birds and trees. An interest in texture and mark making gives her work its strength, beyond the simply illustrative. 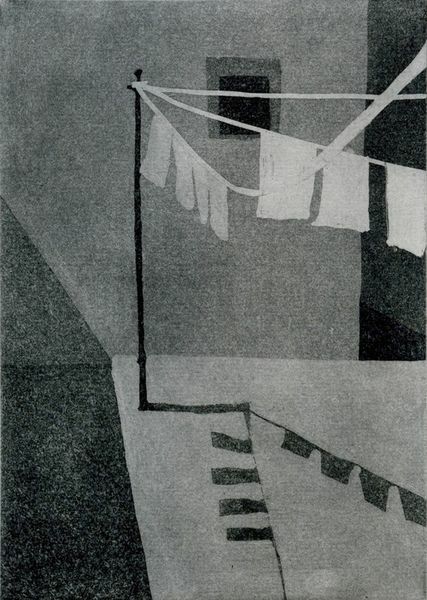 For this particular show she has gathered a number of new works all of which reflect one particular 'moment in time' the ordinary and extraordinary that could have gone unnoticed. Over the last 15 or so years my intermittent observational work has often focussed on the sea. I have a great yearning to live by the sea. In my drawings of the sea, I wanted to show the passage of the waves moving, time passing. During the last six months I have been investigating materials and processes in order to make a series of casts of lines and marks left by seawater currents. 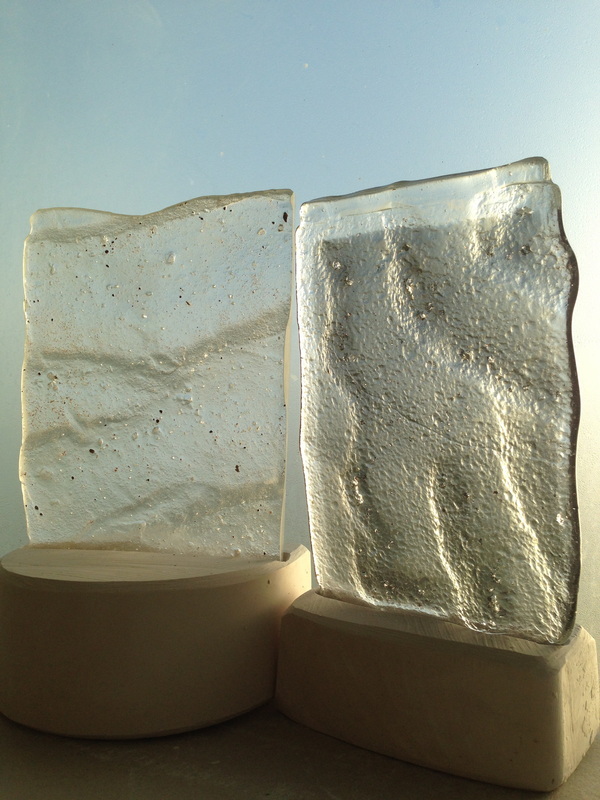 I have attempted to create a lasting record of these transitory impressions through use of casting and slumped glass. I am interested in the fact that the main ingredient for both glass and sand is silica. The concept of glass filling the forms left by the sea seems a fitting match of idea and material. 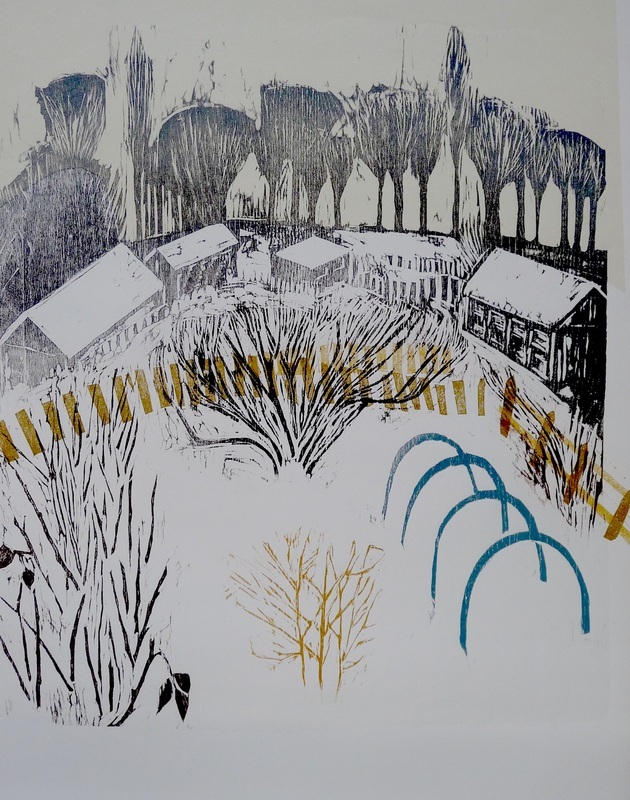 Joanna Bourne lives in the West End of Newcastle and this area is the inspiration for her prints which describe the local area encompassing the allotments, moor and park - nature in an urban landscape. 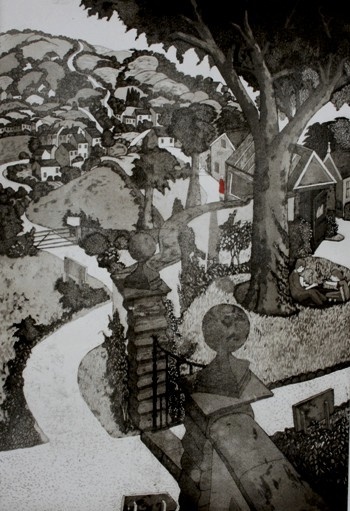 Jo's prints aim to convey the feelings or impressions of a particular moment in time at a specific place, and she is developing her use of woodcut to explore the degrees of transparency and subtlety which can be achieved with this medium. 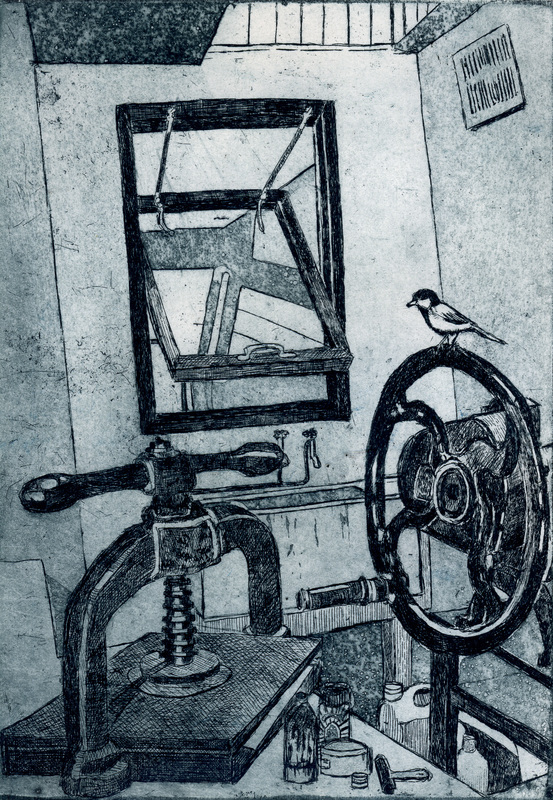 Michael is an artist-printmaker who creates limited edition etchings, lino prints and fine art books and recently turning his hand to wood engraving. Images are figurative, narrative and located in the Yorkshire countryside. Images evolve from brief outline sketches made in sketchbooks. The desired composition is then either etched with nitric acid, onto copper plates, or cut into lino, which are then printed onto fine hand-made papers by hand using antique printing presses dating from the 19thcentury. My work records the changing face of the city environment. I am fascinated by the transient moments where reflections shimmer and fracture in the windows puddles and canals. The distortions and blurring created in this way create a mysterious and unusual view of these everyday scenes. The reflections in shop windows allow the exterior city environments to be superimposed upon the interior view. 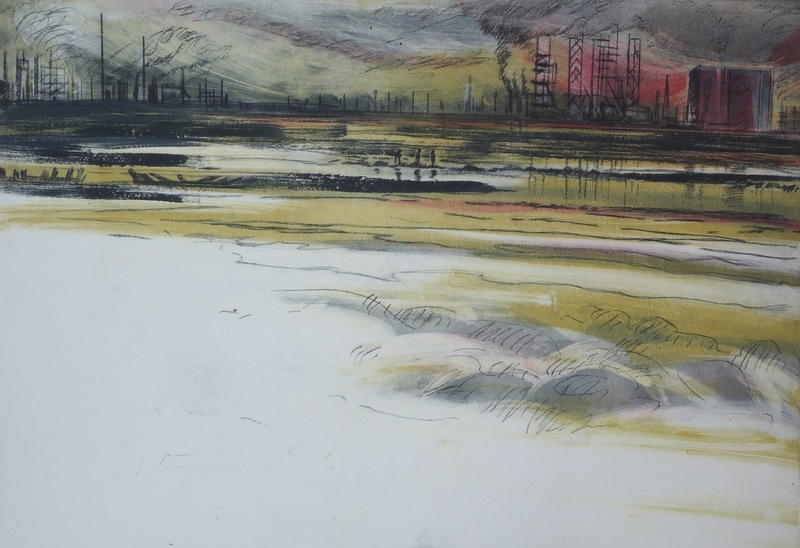 My paintings and prints record the fleeting and ever changing aspects of our environment. 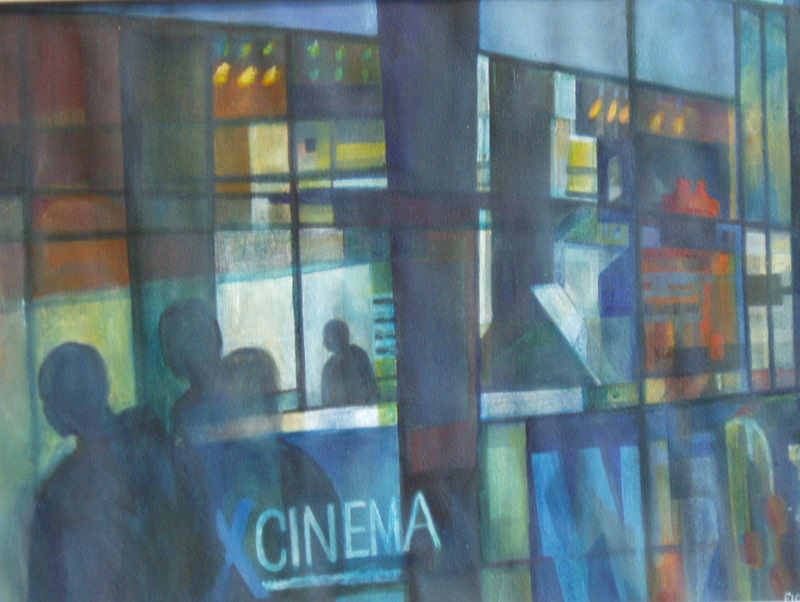 My work is based on observation and drawing and is always about places - real, imagined or a mixture of the two. I have a broad interest in landscape, although the city is a major focus of my work and even my rural landscapes usually feature the marks of habitation. I am interested in the glamour and fascination of landscapes, and in the hold that even very ordinary places can have over our imagination.